As the historic resistance of YPG/YPJ (Rojava’s heroic People’s/Women’s Defense Forces) fighters against the ISIS gangs goes into its 58th day in Kobanê, the Kobanê Crisis Coordination group held a press conference in the Arîn Mîrkan Tent City in the Suruç district of Urfa regarding their report on the refugees sheltered in the district. The Kobanê Crisis Coordination, which was formed by the Democratic Society Congress (DTK), DBP (Party of Democratic Regions, formerly BDP), HDP (Peoples’ Democratic Party), HDK (Peoples’ Democratic Congress), the Suruç Municipality, and the Rojava Solidarity and Aid Association, organized the press conference regarding the ongoing resistance in Kobanê, solidarity and support actions at the border, and the situation of Kobanê refugees in the district. HDP Urfa MP İbrahim Ayhan, HDP Mardin MP Gülser Yıldırım, DBP Urfa Provincal Co-chair Celalettin Ekmen, HDP Party Assembly Member Mehmet Doymaz, DBP Suruç District Co-chair İsmail Kaplan, and Rojava Solidarity and Aid Association Member Faruk Tatlı all participated in the press conference. 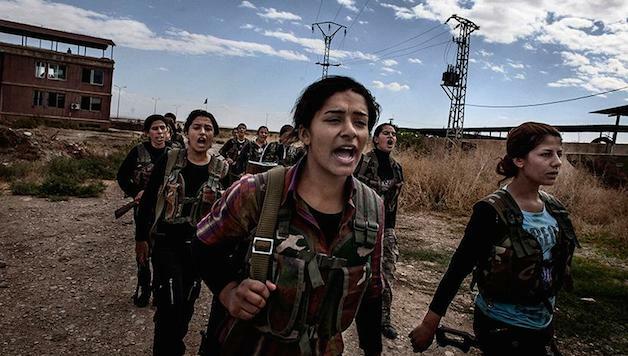 YPG (People’s Protection Unit) fighters in Kobanê. Harvest is a blog dedicated to supporting the revolutionary, democratic, and progressive forces in Turkey and the Kurdish Freedom Movement.